If you ever tire of potatoes, rice and pasta, there are many other simple sides to put a starch on the plate – risotto, gnocchi, dumplings, grits and polenta, for example. I grew up with a meat, starch and vegetable on the plate every night at dinner, and I still follow that plan. But, as you know, in the South we often put more than one starch on the table, if you count bread, plus we mix beans with rice and frequently serve legumes in addition to other starches. There is no problem there unless you’re watching calories, and we all know starches can be a dieter’s nightmare. I have tried cooking all of the above, but I fell into the rut of eating what I thought were exotic sides only in restaurants. Oh, I adore John Besh’s gnocchi. And, I love a creamy polenta in a good Italian restaurant. Why are so many of these foods Italian? I say it’s because Italians know how to cook. Anyway, I started watching Giada De Laurentiis’ and Ina Garten’s Food Network shows make these mouth-watering dishes look easy, and decided I should incorporate them into routine cooking. I won’t say I’m there yet, but I’m finding them easier than I remembered in my earlier experimentations. A standby that I’ve always cooked, however, is a recipe given to me many years ago for baked grits, which I sometimes call grits soufflé. It goes especially well with grillades. My other favorites are risotto and polenta, both of which go well with many meats or fish. 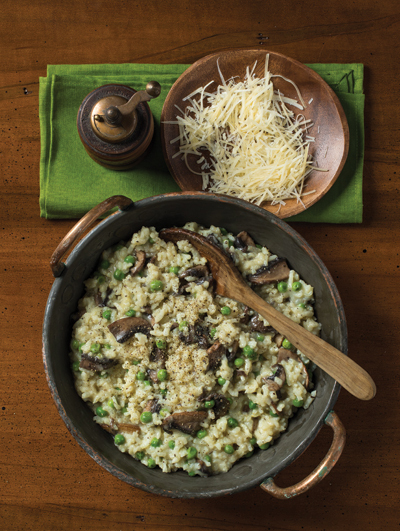 The following risotto eliminates the stirring and frequent additions of broth by simply putting the Italian rice and stock in the oven for 45 minutes. Thank you, Ina. Depending on what you put with it, risotto can be a meal in itself. My daughter is crazy about quinoa. She makes a huge bowl of it for the week and spoons it out to match up with red beans, chicken or steak. And don’t forget couscous; that’s an easy little grain to cook, and it goes with just about everything. Bring 4 cups of the chicken stock to simmering in a Dutch oven. Add rice, cover and bake for 45 minutes, until most of the liquid is absorbed and the rice is al dente. Remove from the oven, add the remaining cup of chicken stock, Parmesan, wine, butter, salt and pepper, and stir vigorously for 2 minutes or until the rice is thick and creamy. Add the peas and mushrooms and stir. Serve hot. Preheat oven to 350 degrees. Generously grease a 1½-quart ovenproof casserole or soufflé dish. In a medium saucepan, bring water to a boil. Add salt. Gradually add grits, stirring. Reduce heat to low, cover and cook for 5 minutes, stirring occasionally to eliminate any lumps. Remove from heat, stir well and set aside. Separate eggs, placing whites in an electric mixer along with the extra white. Whip whites until stiff. Place yolks in a large bowl and whisk until fluffy. Gradually add milk, whisking. Add butter and whisk. Gradually whisk in grits until blended well. Gently fold whites into the yolk mixture and pour into the greased baking dish. Bake for 1 hour or until the center is set and top is browned. This dish is best served as soon as possible after baking. Leaving the garlic cloves unpeeled, drizzle with olive oil and roast in a 350-degree oven until tender, about 10 to 15 minutes. Remove peel and mash with a fork. Bring water to a boil in a heavy pot. Add salt and gradually whisk in the cornmeal. Reduce heat to low and cook, stirring often, until mixture thickens and the cornmeal is tender, about 15 minutes. Remove pot from heat and add cheeses, milk, butter and garlic. Stir until butter and cheeses have melted. Season with salt and pepper to taste. Transfer polenta to a bowl and serve.